Big (old) news from the NPO – way to go! In March, National Parents Organization of Utah, successfully spearheaded passage of the state’s first shared parenting legislation! HB35 wasn’t the only success NPO Utah had, but it was the most significant. Headed by Dave Daniels and Janet Robins, NPO Utah is on a roll! NPO Utah wants to thank Representative V. Lowry Snow for sponsoring HB35 and working so closely with NPO to help ensure its passage. He is an excellent legislator who practiced family law and saw up close many of the challenges parents and their children face when custody is considered. He understands these issues very well, and we appreciate his hard work on the bill. NPO also wants to acknowledge the Utah State Bar’s Family Law section that endorsed HB35. Under current Utah law, a noncustodial parent is entitled to a minimum schedule of every other weekend (Friday evening to Sunday evening) and one week night per week for three hours. Additionally, noncustodial parents are entitled to one-half of the annual holidays and four weeks during the summer. This schedule, often referred to as the “standard minimum,” when originally enacted, was intended to be the minimum a noncustodial parent and his/her children should spend together. All too often, however, litigants, attorneys, and judges forgot that this is intended to be the minimum, and instead consider it the maximum time arrangement. This of course is bad for children as well as their noncustodial parents. HB35, which takes effect on May 19, creates an optional schedule with a more equitable, shared parenting arrangement. It changes the weekly parent-time night to an overnighter, instead of merely a few hours after school, and also extends weekend time from returning the children Sunday night to returning them Monday morning. This arrangement can be especially beneficial in higher-conflict divorces, since pick-ups and drop-offs can be made at school or daycare, reducing the number of interactions between quarreling parents. The new option provides an increased parent-time schedule from 80 overnights per year to 145. That’s about 40% of parenting time being awarded to the noncustodial parent. Noncustodial parents must first meet some fairly narrowly-defined criteria in order to qualify for the optional schedule, such as: 1) demonstrate that he or she has been actively involved in the child’s life, 2) communicate effectively regarding the child, and 3) any other factors the court considers relevant. Utah NPO executive committeeman and legislative affairs expert Dan Deuel, who has six years of experience working on various pieces of legislation, including pro-family legislation, urged the 107-member legislature to pass this family-friendly bill. It ultimately passed both houses of the legislature with only one dissenting vote, and was signed into law by Governor Gary Herbert on March 20, 2015. NPO of Utah members Amanda Davis, Janet Robins, Michelle Troche, and others joined Deuel on Utah’s Capitol Hill in strong support of this timely piece of legislation. NPO of Utah also orchestrated a campaign of members statewide, urging them to contact their lawmakers in support of HB35. While this bill is by no means perfect, it is a step in the right direction. NPO of Utah intends to work on refining the statute in future years to further improve Utah’s child custody law. Well done Dan and all at NPO Utah! http://www.concordiafamilies.com/wp-content/uploads/2017/06/unnamed-300x168.jpg 0 0 Triston Morgan http://www.concordiafamilies.com/wp-content/uploads/2017/06/unnamed-300x168.jpg Triston Morgan2018-02-10 18:12:002018-02-08 18:32:28Big (old) news from the NPO - way to go! We are going to establish a standard of practice in the assessment of attachment-related pathology surrounding divorce. We are then going to move toward professional expertise. Mental health professionals who know what they’re doing – within standard and established constructs and principles. Attachment-related pathology is always created by pathogenic parenting. A child’s rejection of a parent (attachment-related pathology) is either being caused by the pathogenic parenting of the targeted-rejected parent (through hostile-aggressive child abuse), or it is being caused by the pathogenic parenting of the allied and supposedly “favored” parent (through the formation of a cross-generational coalition with the child against the other spouse-and-parent). A semi-structured six-session treatment-focused assessment protocol can identify the source of pathogenic parenting creating the attachment-related pathology. There are four mental health professionals that I know of who are qualified to conduct a treatment-focused assessment of attachment related pathology surrounding divorce. Each of these mental health professionals has trained with me personally, and each has direct access to me for consultation as needed. These four mental health professionals are Certified in AB-PA, including administration and documentation of the six-session treatment-focused assessment protocol. We are establishing a ground foundation of professional knowledge in the standard and established constructs and principles of professional psychology required for professional competence, and ultimately for professional expertise. Does a mental health professional need to be “certified” to conduct a treatment-focused assessment protocol? No. Absolutely not. All mental health professionals should be conducting a treatment-focused assessment of attachment-related pathology surrounding divorce right now. It’s all standard and established professional psychology. Can they? I have no idea. I am appalled by the degree of professional ignorance and incompetence that’s out there. I do know this. There are four mental health professionals who can. They are the certified mental health professionals I worked with across three days of seminars in November. 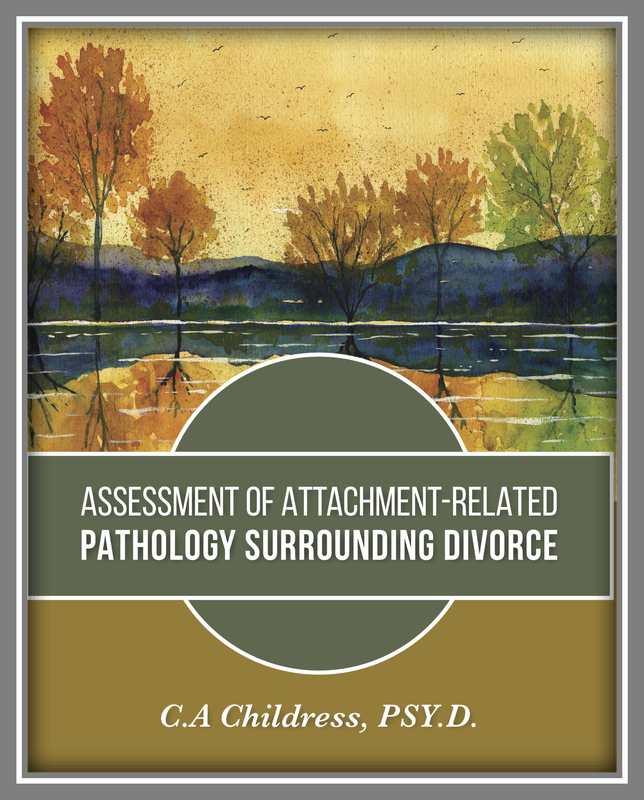 There are four mental health professionals who absolutely know how to conduct a treatment-focused assessment of attachment-related pathology surrounding divorce. They have the knowledge, and they have my ear if they want consultation on a particularly troubling case. What’s more they have each other. They don’t realize this yet, but as things develop I’m planning to encourage a network of inter-professional consultation across AB-PA Certified mental health professionals; to use each other as resources of professional consultation. What the Bowlby-Minuchin-Beck model of AB-PA provides is a shared common knowledge and language of professional psychology – cross-generational coalitions, emotional cutoffs, personality pathology, splitting, attachment trauma – all understood even before the consultation begins. The constructs of established professional psychology (Bowlby, Bowen, Beck, Minuchin, Millon) can unravel the diagnostic complexities and treatment issues. There are four mental health professionals who are certified in AB-PA, who understand the pathology, who know what to do, and who are part of a growing network of professional collaboration. Jayna Haney, MS, LPC Intern: Houston, Texas. Ms. Haney is in a leadership role in bringing professional knowledge and expertise to the solution for “parental alienation.” She has studied with Karen Woodall in Great Britain as well as becoming Advanced Certified in AB-PA with me in November. Of additional note, Jayna is also trained in EMDR treatment for trauma and brings this additional trauma expertise to her work with the complex trauma of “parental alienation.” Jayna Haney has my full support, and she has my ear. Michelle Jones, LCSW: Provo, Utah. Michelle Jones, LCSW is a licensed clinical social worker who works with Concordia Families agency in Provo, Utah. Ms. Jones brings her AB-PA Advanced Certification into a professional clinic already experienced with the family pathology of “parental alienation” and court-involved families. Michelle Jones and the therapeutic team at Concordia Families has my full support, and they have my ear. Ms. Colgan brings a wealth of experience to her work. She holds a Master’s Degree in Counseling and Human Relations, she is a Licensed Professional Mental Health Counselor, she is a National Board Certified Counselor and a Certified Mediator. Ms. Colgan has extensive experience working with high-conflict divorce and is a strong resource in the Philadelphia, Wilmington, and Baltimore area. Larken Sutherland is a Licensed Professional Counselor and Parenting Coordinator/Facilitator in private practice in Corpus Christi, Texas. Ms. Sutherland is experienced in working with high conflict families and she is Certified in AB-PA, she is a strong resource for families in the Corpus Christi area. Ms. Sutherland has my full support, and she has my ear. Three others also received Certification in AB-PA, one is a legal professional, and two are parent-advocates. JulieAnne Leonard is an attorney who is completing her psychology degree in developmental psychology. Of note is that developmental psychology is a particularly useful domain of knowledge for understanding the influence of parenting on child development. Ms. Leonard has an extensive background serving as a Guardian ad Litem with high-conflict families. Through her legal background as an attorney, her extensive experience as a GAL, and her AB-PA Certification, Ms. Leonard represents an exceptionally strong resource for the Court in assisting the Court to identify “parental alienation” pathology and in coordinating effective treatment services for the family. Peter Knudsen is a parent-advocate located in the Netherlands. He is active in bringing the knowledge and protocols of AB-PA to the European mental health system and family courts. Peter and I are currently collaborating on several avenues for expanding AB-PA into the European mental health and family law systems. Peter has my full support and he has my ear. Bryan Hale is a theology student and parent-advocate completing his degree in theology with the goal of becoming an ordained minister. I suspect the universe has designs for the life of Mr. Hale. He brings a unique array of talents to the solution, including a strong background in business and in creating organization support structures for projects and endeavors. Bryan Hale has my full support, and he has my ear. I know that these four mental health professionals can conduct a treatment-focused assessment of attachment-related pathology surrounding divorce. These four mental health professionals are a verified resource for knowledge and professional skill sets for families, family law attorneys, and the Court. As an attorney and Guardian ad Litem, JulieAnne Leonard also represents a strong resource for the Court in helping the Court to identify “parental alienation” and in coordinating the treatment. Peter Knudsen, Bryan Hale, and I will be working behind the scenes on creating the support structures for change across the entire mental health and family court systems, for all children, everywhere. As importantly… they are the core for a network of consultation support for each other, each bringing a different facet of knowledge, yet all with a common foundation of knowledge. This is not about me. This is about you. You are the change. I am merely a catalyst. I am simply the clarion call returning professional psychology to the ground foundations of professional psychology; Bowlby, Minuchin, Beck, Millon, Bowen. You are the agents of change. We are establishing a ground foundation of knowledge and standards of practice for the assessment, diagnosis, and treatment of attachment-related family pathology surrounding divorce. From this foundation, we then build professional expertise. The ground foundation is not me. It’s Bowlby-Minuchin-Beck and the established constructs and principles of professional psychology. This is about you and your children. This is about solving the family pathology of “parental alienation” for all children everywhere.